Mighty Badge™ Corporate Pack There are 8 products. The Mighty Badge™ Corporate Pack is intended for use by companies with up to 50 customer/public facing personnel. 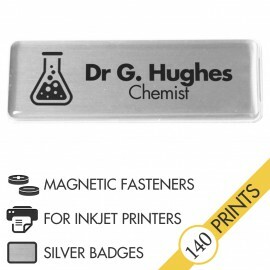 Each corporate pack consists of the means to self-produce to reprint 50 high quality professional looking name badges at least twice each, providing the means for up to 140 badge issues and further printable badge inserts can be bought separately if required. Innovative strong magnetic fasteners ensure secure, damage-free attachment to garments. Traditional safety-pin fasteners are also available. The clip-together front lens construction ensures that the high quality brushed gold or silver finish of each badge is enhanced and protected against scratching and wear. Packs are available in gold or silver, with insert sheets designed specifically for either LASER or INKJET printers. only £ 1.66 per Badge Print! Produce up to 140 Brushed Gold professional quality badges with any compatible laser printer by using the user-friendly NamePrint Graphics® design program. 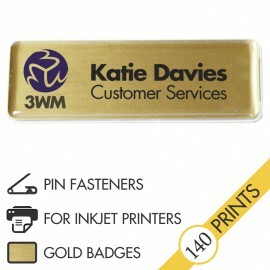 only £ 1.89 per Badge Print! Produce up to 140 Brushed Gold professional quality badges with any compatible inkjet printer by using the user-friendly NamePrint Graphics® design program. Produce up to 140 Brushed Silver professional quality badges with any compatible laser printer by using the user-friendly NamePrint Graphics® design program. Produce up to 140 Brushed Silver professional quality badges with any compatible inkjet printer by using the user-friendly NamePrint Graphics® design program. 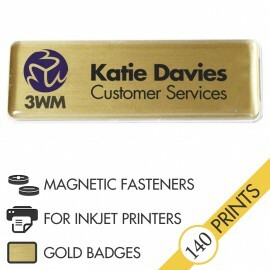 only £ 2.25 per Badge Print!